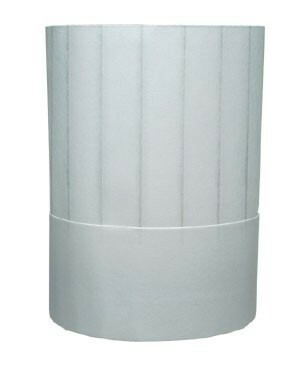 Chef Revival H049 Pinstripe Disposable Chef Hat 8-1/2"
TigerChef > Smallwares > Chef Wear > Chef Hats >< Disposable Chef Hats > Chef Revival H049 Pinstripe Disposable Chef Hat 8-1/2"
$49.05 Chef Revival H055 Corporate Disposable Tall Chef Hat 7"
Offering a crisp, clean look, the Chef Revival H049 Pinstripe Disposable Chef Hat 8-1/2" is the perfect accessory for chefs working in a busy kitchen. Designed with an adhesive closure, this chef hat hugs the head comfortably for a secure fit. Thanks to its non-woven fiber construction, this chef hat is made to look and feel good and is also disposable for ultimate convenience.